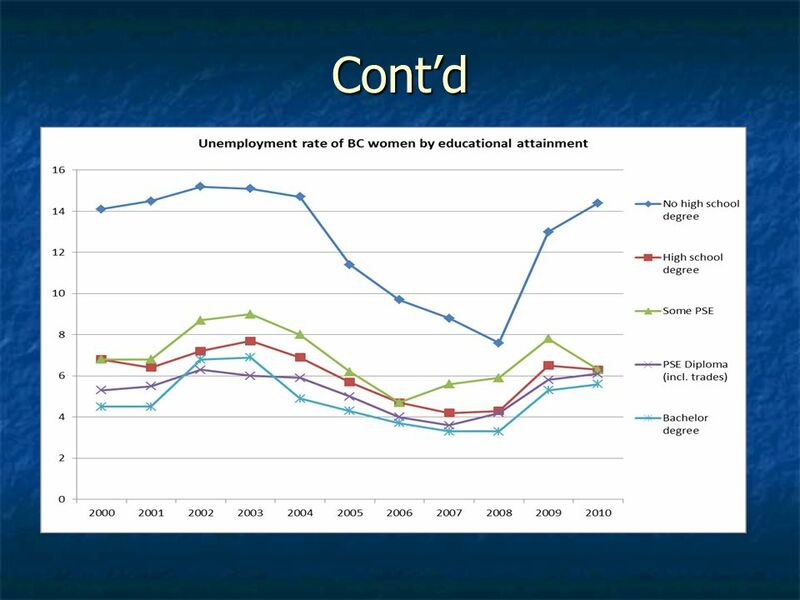 Canadas Self-Imposed Crisis in Post-Secondary Education Keynote Address to Alberta Union of Provincial Employees Education Sector Conference Radisson Hotel. 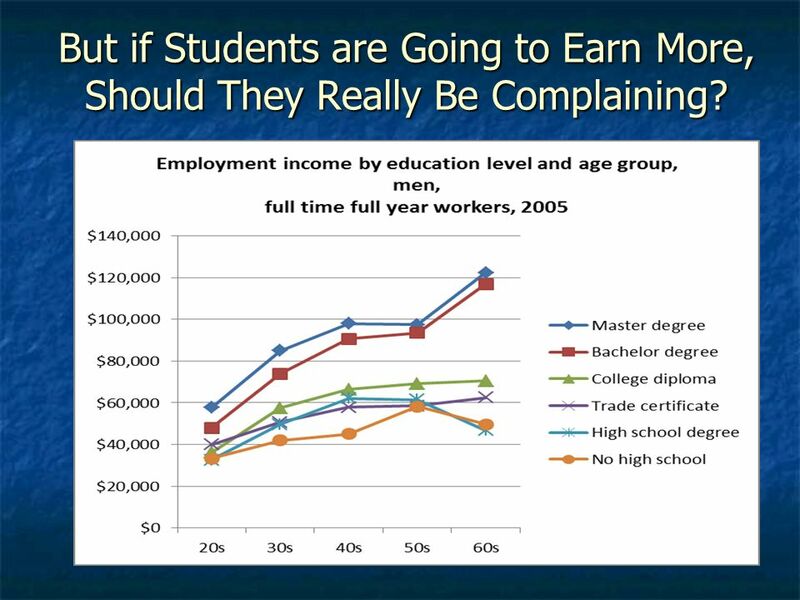 15 But if Students are Going to Earn More, Should They Really Be Complaining? 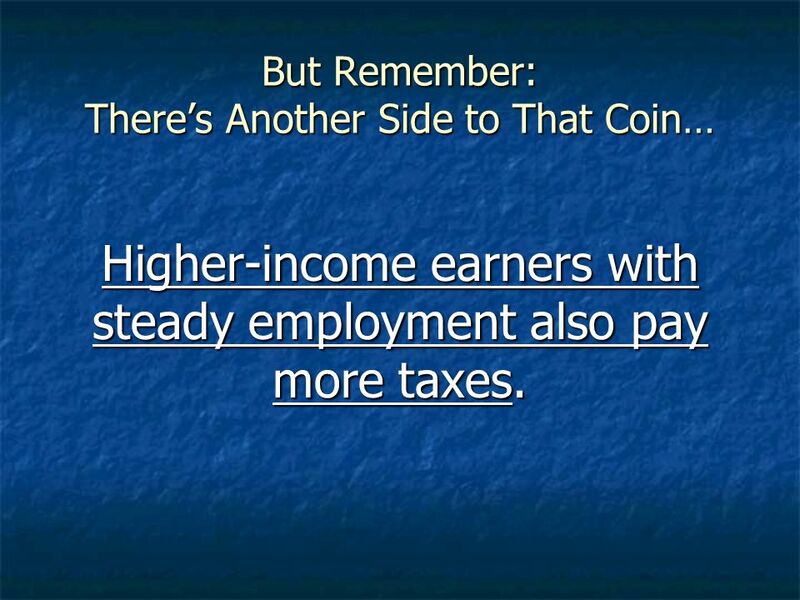 19 But Remember: Theres Another Side to That Coin… Higher-income earners with steady employment also pay more taxes. 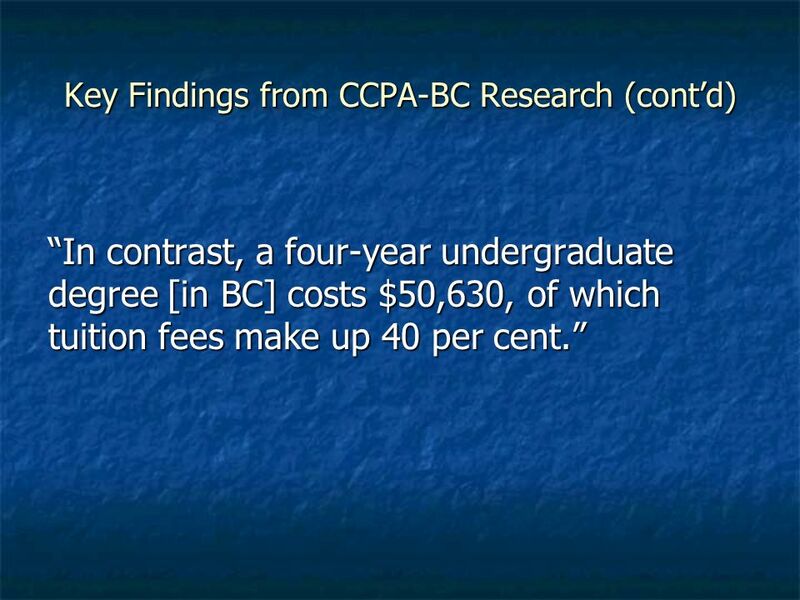 22 Key Findings from CCPA-BC Research (contd) In contrast, a four-year undergraduate degree [in BC] costs $50,630, of which tuition fees make up 40 per cent.In contrast, a four-year undergraduate degree [in BC] costs $50,630, of which tuition fees make up 40 per cent. 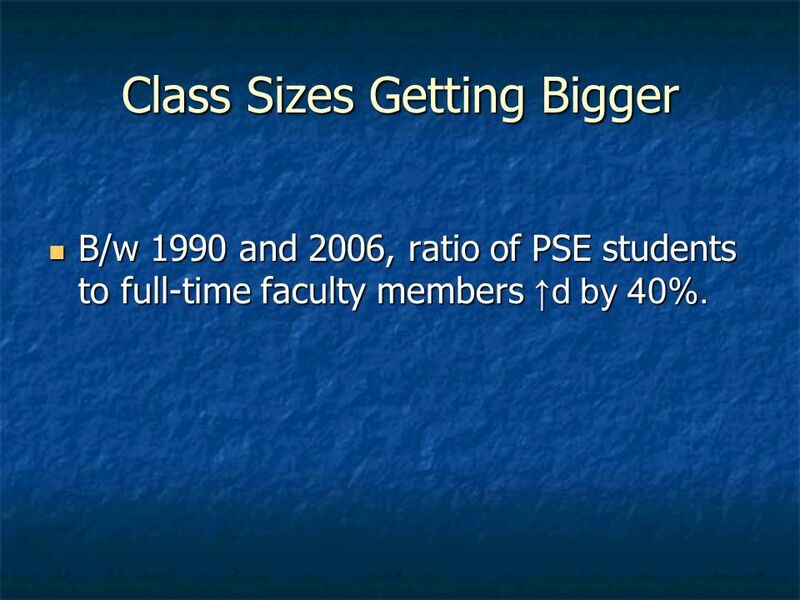 23 Class Sizes Getting Bigger B/w 1990 and 2006, ratio of PSE students to full-time faculty members d by 40%. B/w 1990 and 2006, ratio of PSE students to full-time faculty members d by 40%. 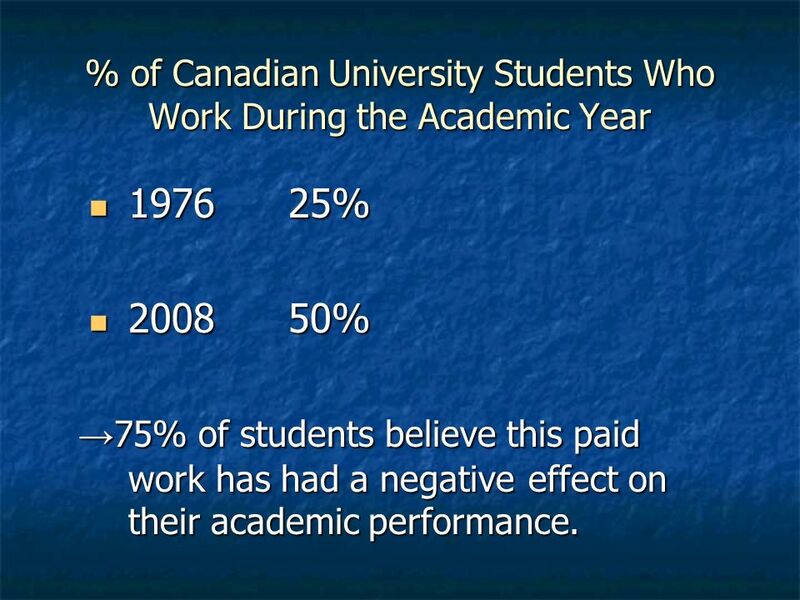 24 % of Canadian University Students Who Work During the Academic Year 197625% 197625% 200850% 200850% 75% of students believe this paid work has had a negative effect on their academic performance. 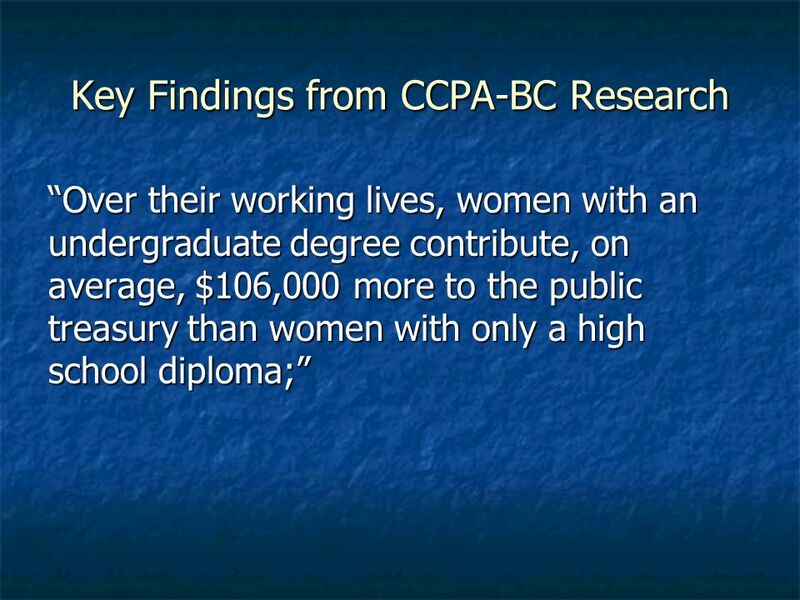 75% of students believe this paid work has had a negative effect on their academic performance. 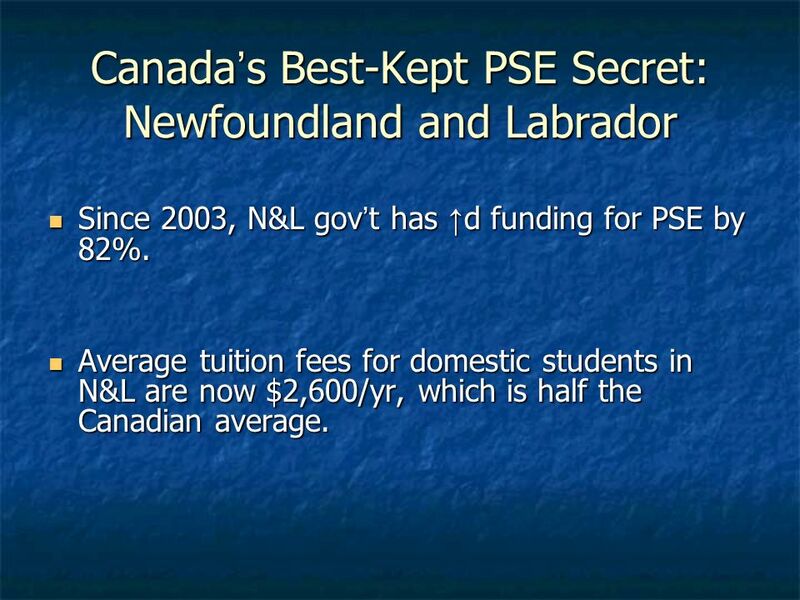 30 Canadas Best-Kept PSE Secret: Newfoundland and Labrador Since 2003, N&L govt has d funding for PSE by 82%. 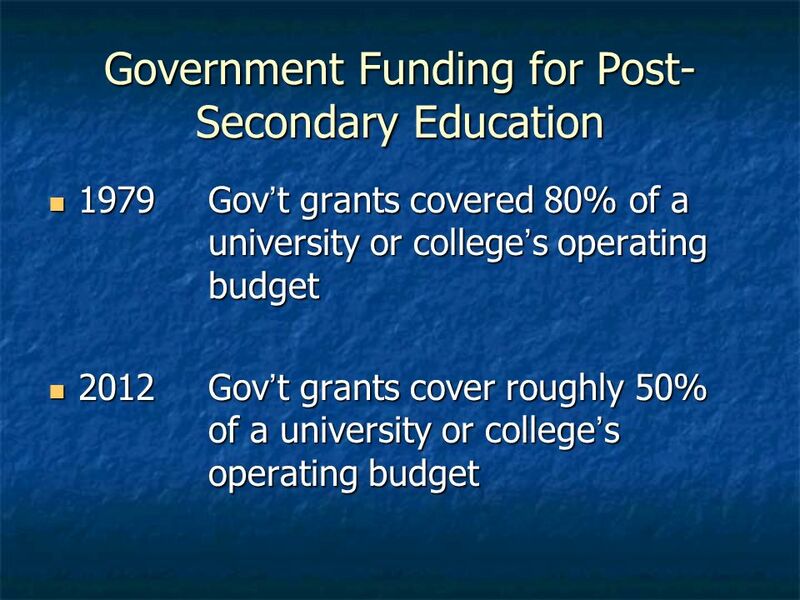 Since 2003, N&L govt has d funding for PSE by 82%. 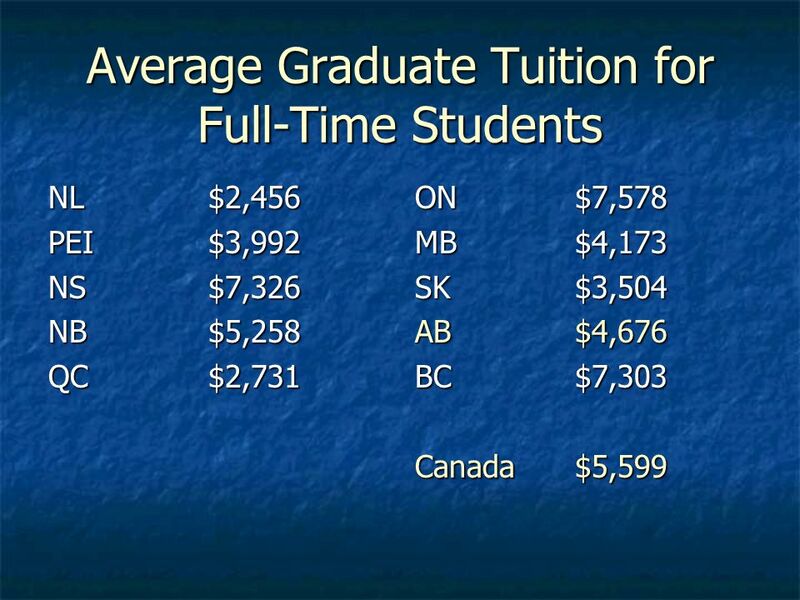 Average tuition fees for domestic students in N&L are now $2,600/yr, which is half the Canadian average. 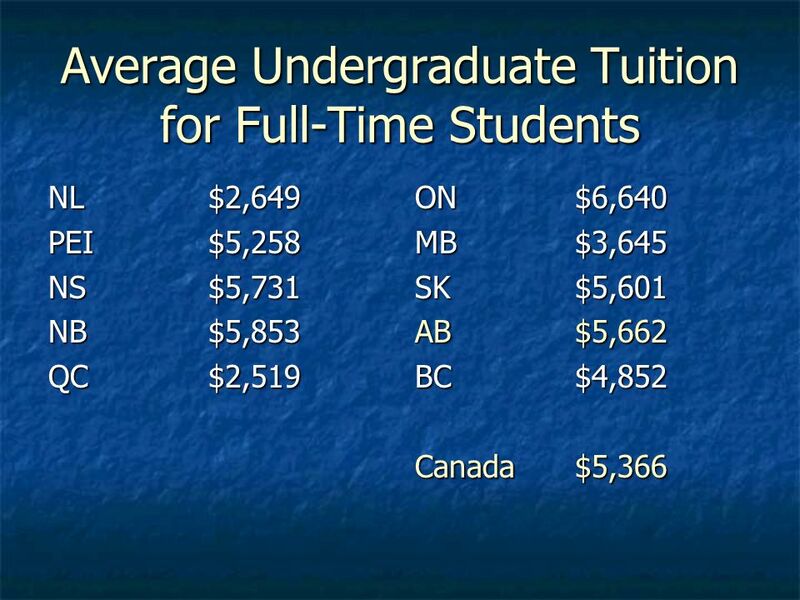 Average tuition fees for domestic students in N&L are now $2,600/yr, which is half the Canadian average. 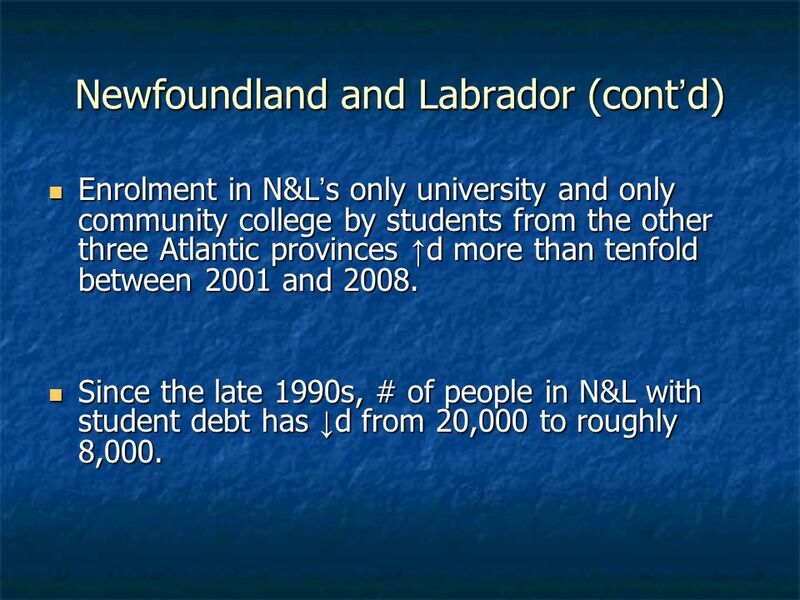 31 Newfoundland and Labrador (contd) Enrolment in N&Ls only university and only community college by students from the other three Atlantic provinces d more than tenfold between 2001 and 2008. 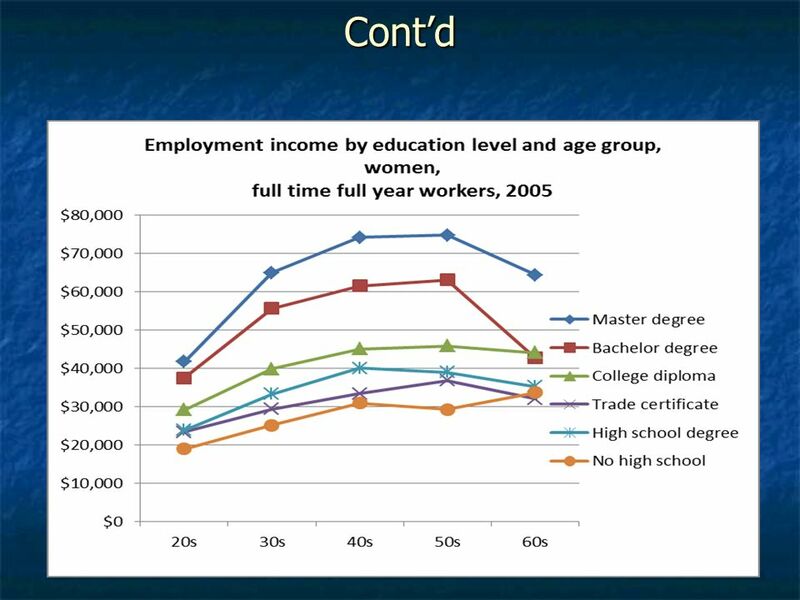 Enrolment in N&Ls only university and only community college by students from the other three Atlantic provinces d more than tenfold between 2001 and 2008. 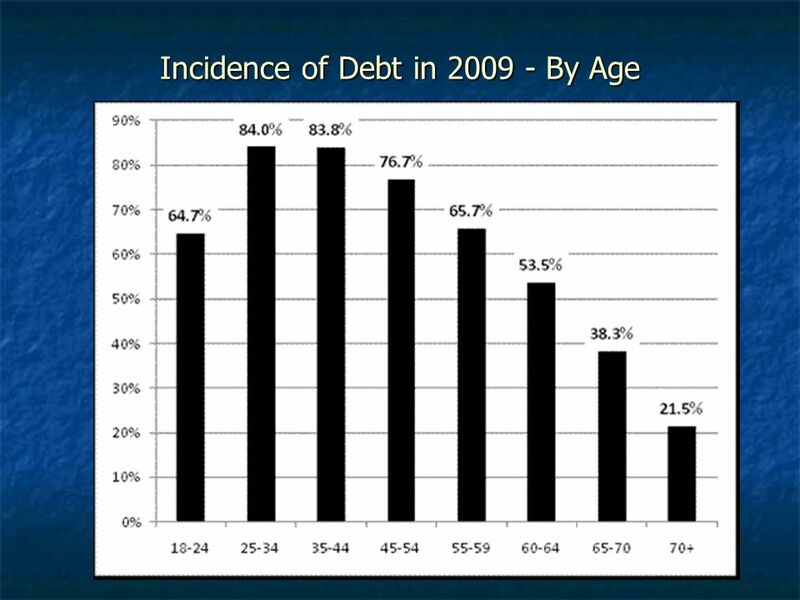 Since the late 1990s, # of people in N&L with student debt has d from 20,000 to roughly 8,000. 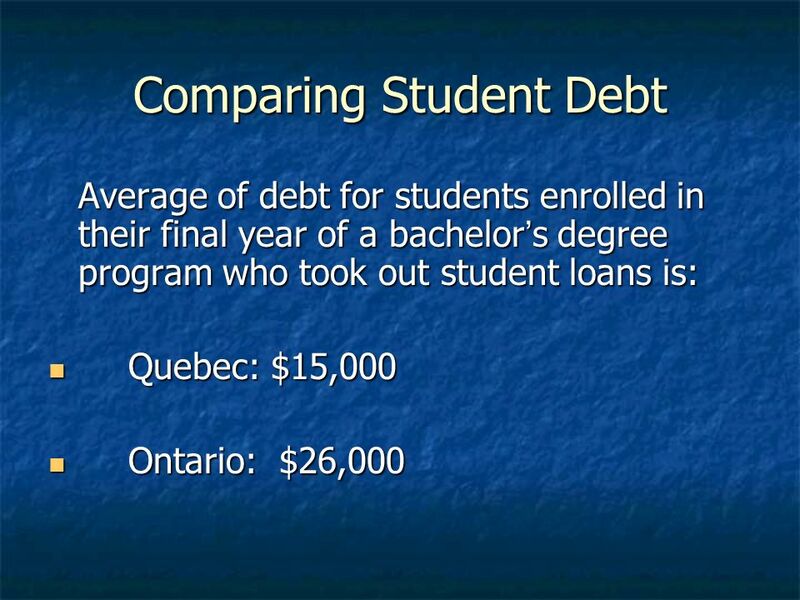 Since the late 1990s, # of people in N&L with student debt has d from 20,000 to roughly 8,000. 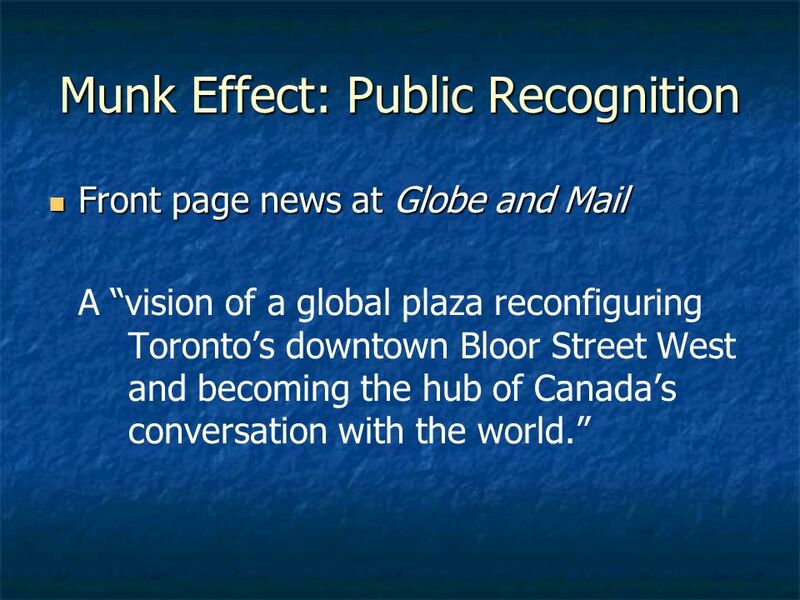 34 Munk Effect: Public Recognition Front page news at Globe and Mail Front page news at Globe and Mail A vision of a global plaza reconfiguring Torontos downtown Bloor Street West and becoming the hub of Canadas conversation with the world. 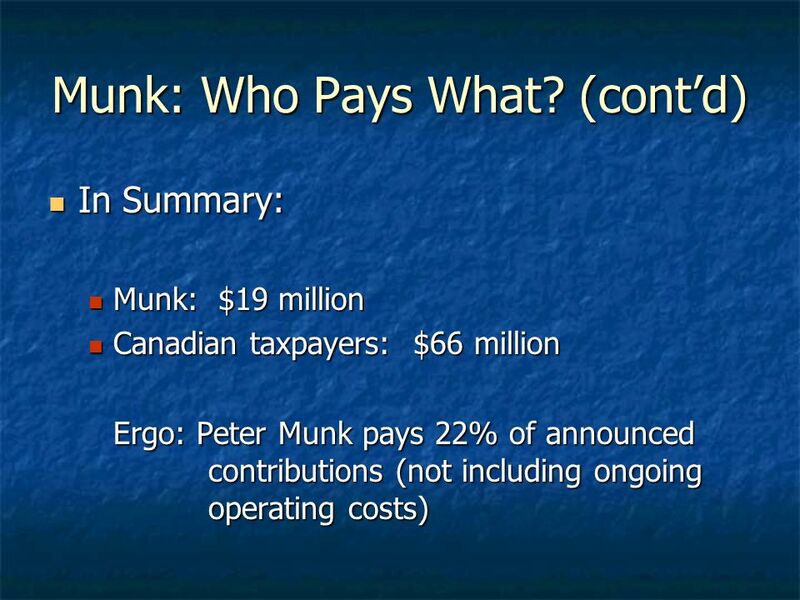 36 Munk: Who Pays What? 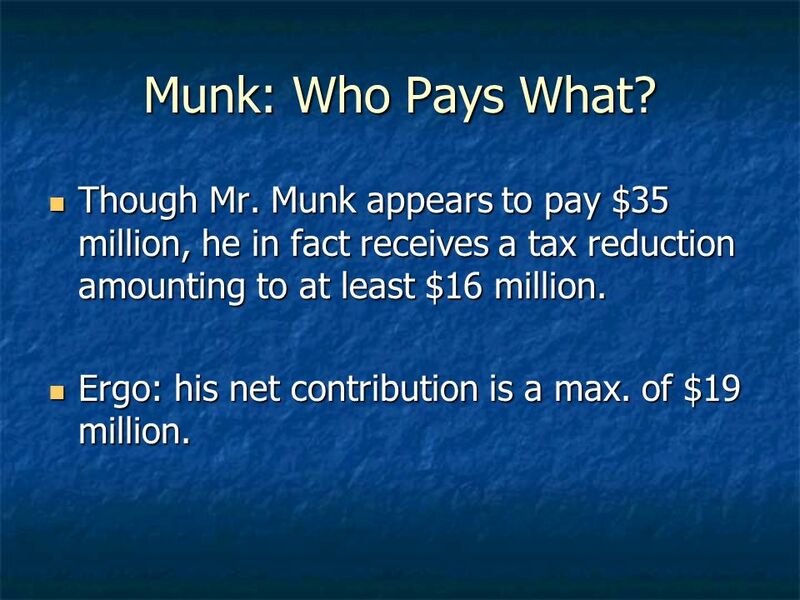 Though Mr. Munk appears to pay $35 million, he in fact receives a tax reduction amounting to at least $16 million. 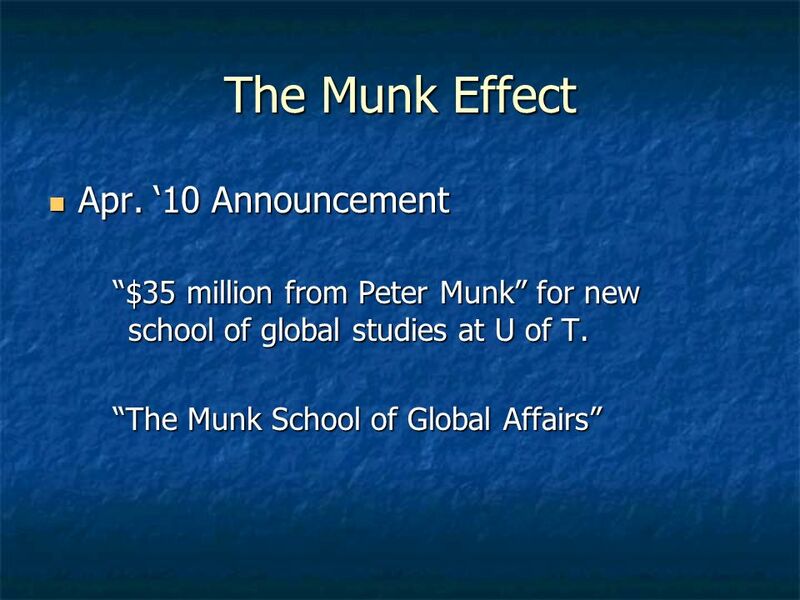 Though Mr. Munk appears to pay $35 million, he in fact receives a tax reduction amounting to at least $16 million. Ergo: his net contribution is a max. of $19 million. Ergo: his net contribution is a max. of $19 million. 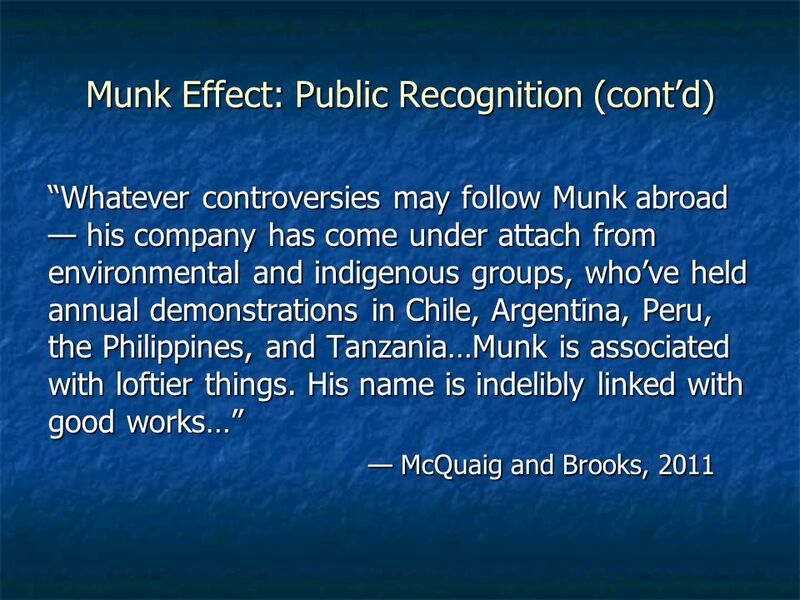 37 Munk: Who Pays What? 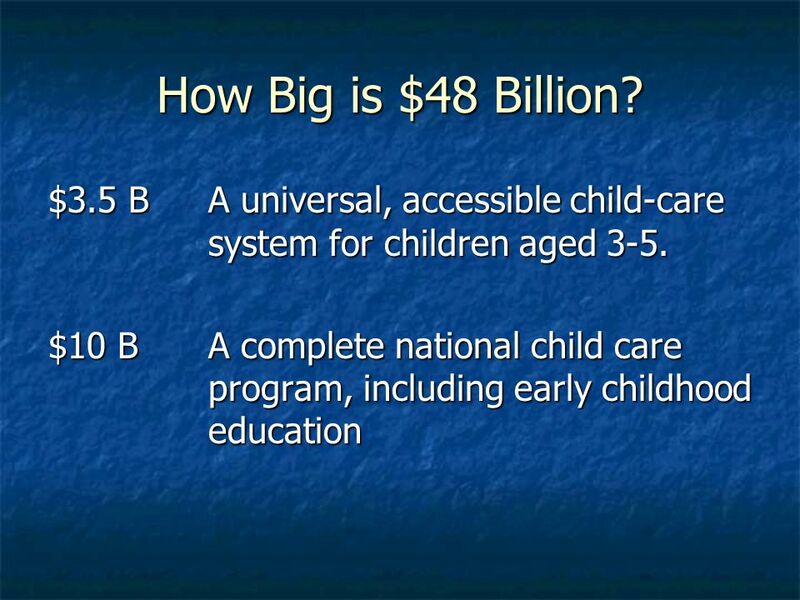 (contd) Federal government and Ontario government have contributed an additional $25 million each. 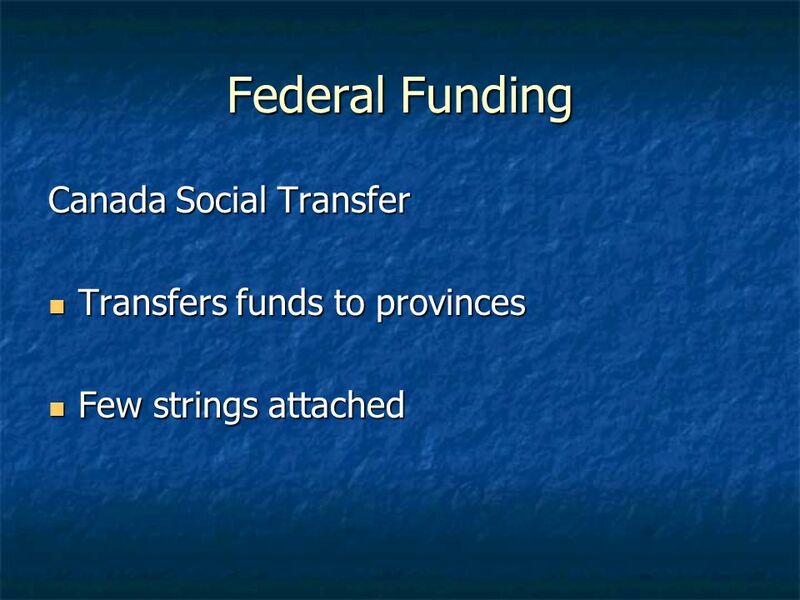 Federal government and Ontario government have contributed an additional $25 million each. 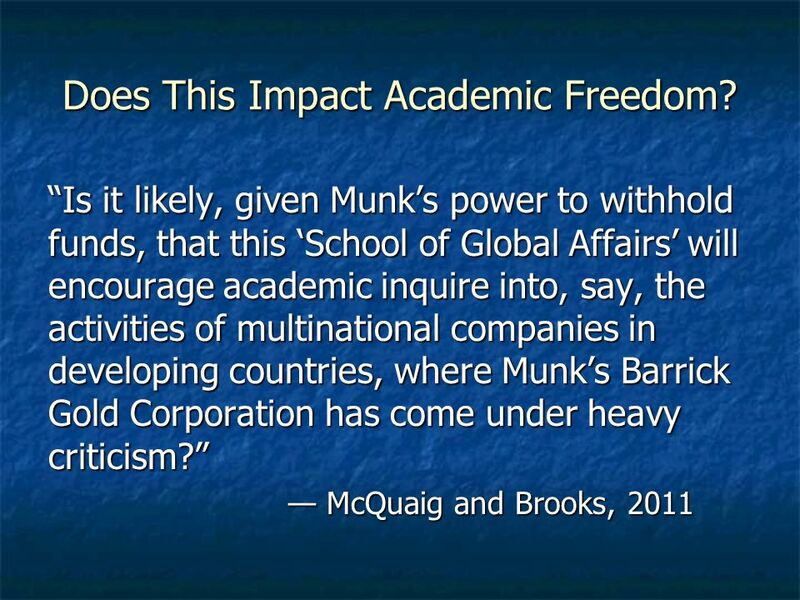 40 Munk: Who Pays What? 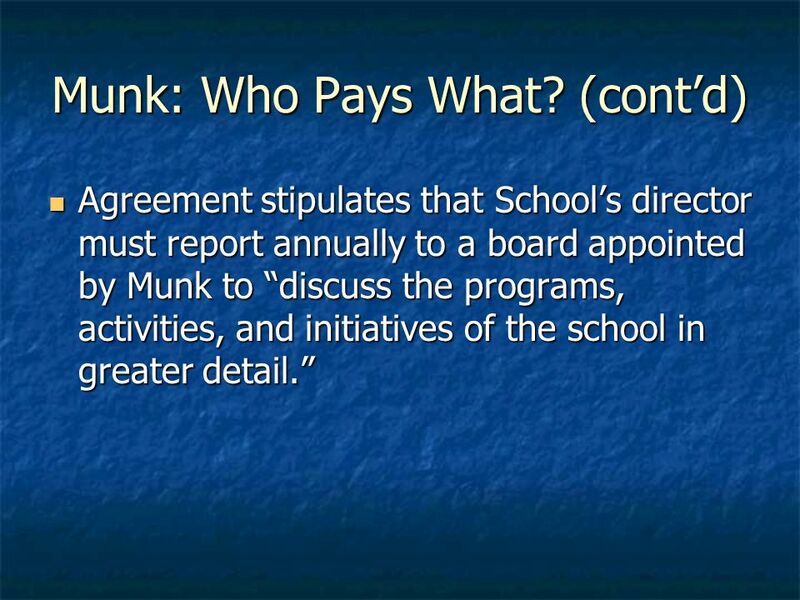 (contd) Agreement stipulates that Schools director must report annually to a board appointed by Munk to discuss the programs, activities, and initiatives of the school in greater detail. 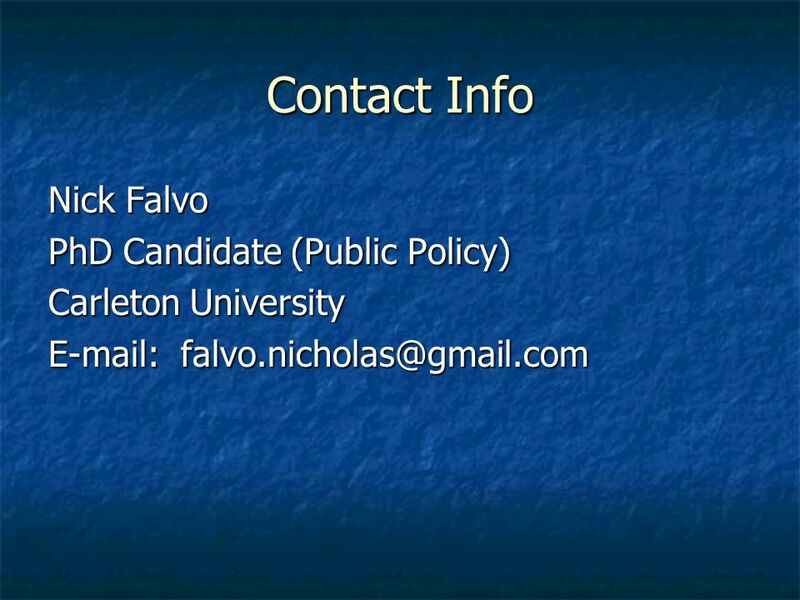 Agreement stipulates that Schools director must report annually to a board appointed by Munk to discuss the programs, activities, and initiatives of the school in greater detail. 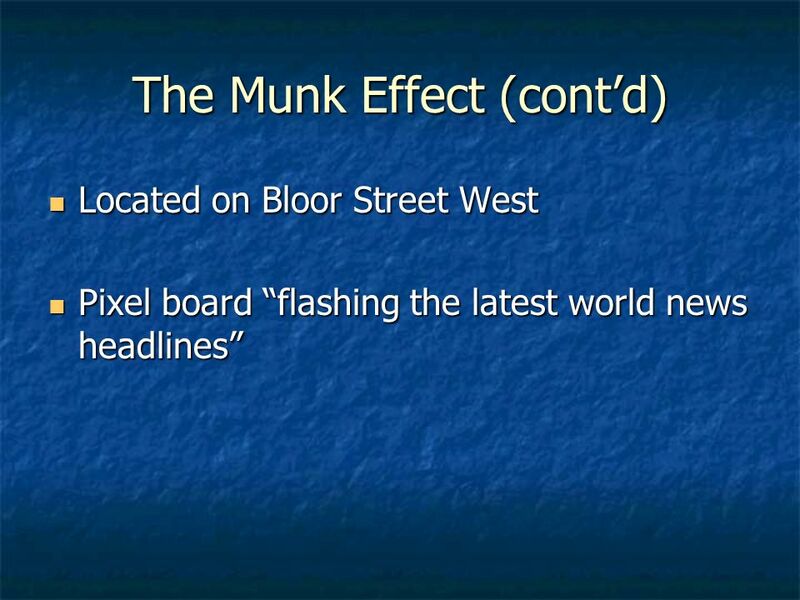 42 Munk: In Sum Munk provided a relatively small amount of money, and, in return, received a personal marketing boost. 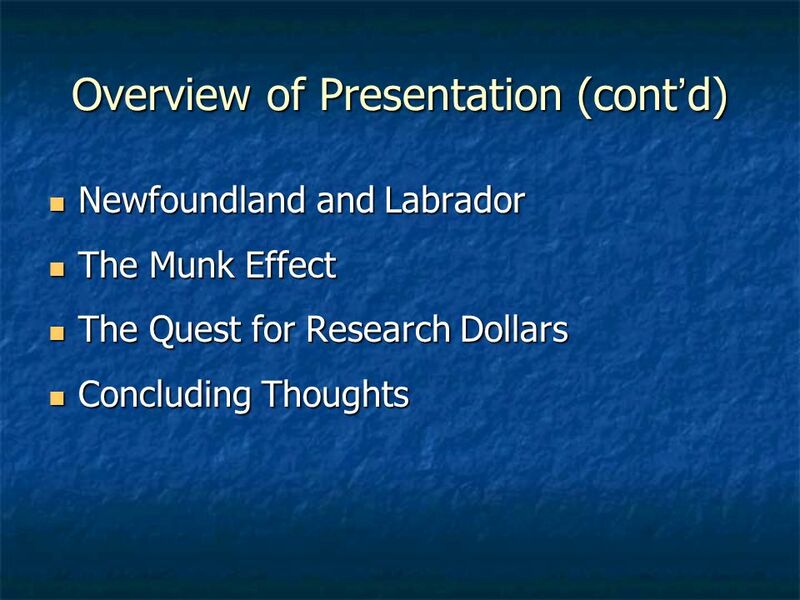 Munk provided a relatively small amount of money, and, in return, received a personal marketing boost. 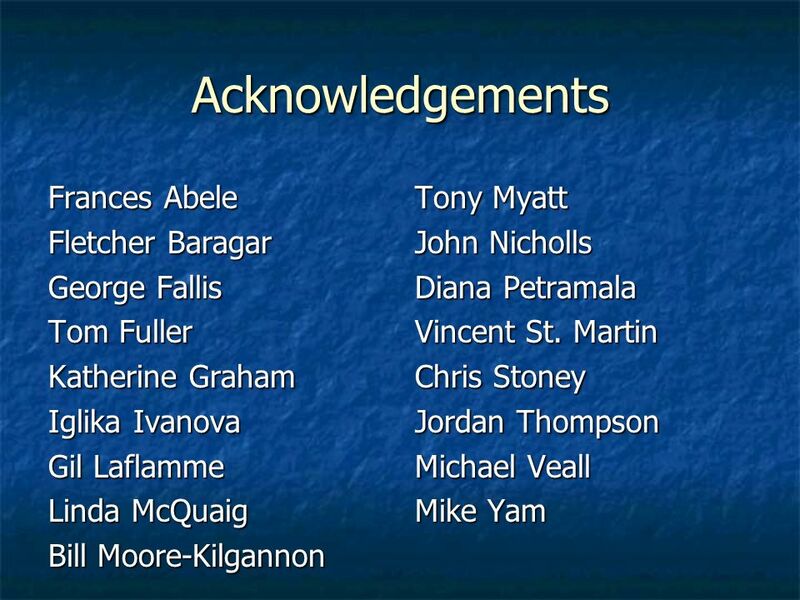 U of T got a relatively small amount of money, and, in return, may have compromised academic freedom for its 80 faculty members. 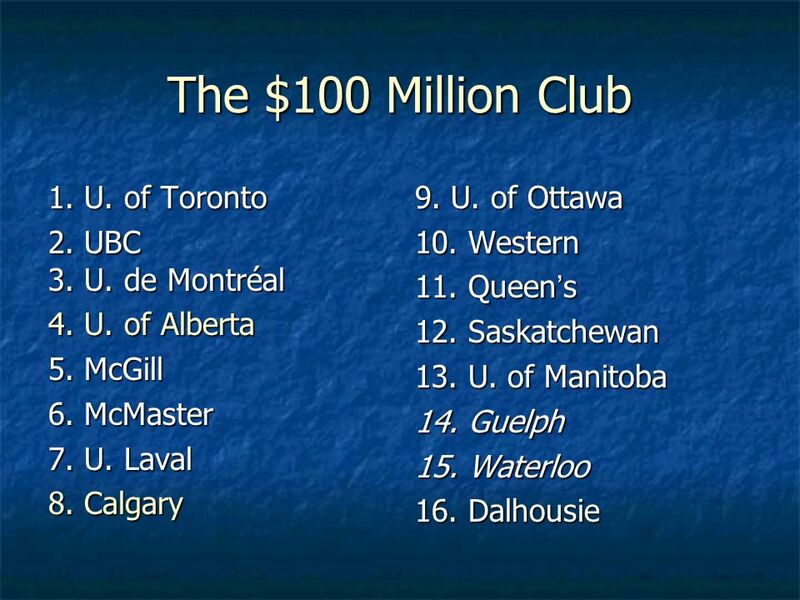 U of T got a relatively small amount of money, and, in return, may have compromised academic freedom for its 80 faculty members. 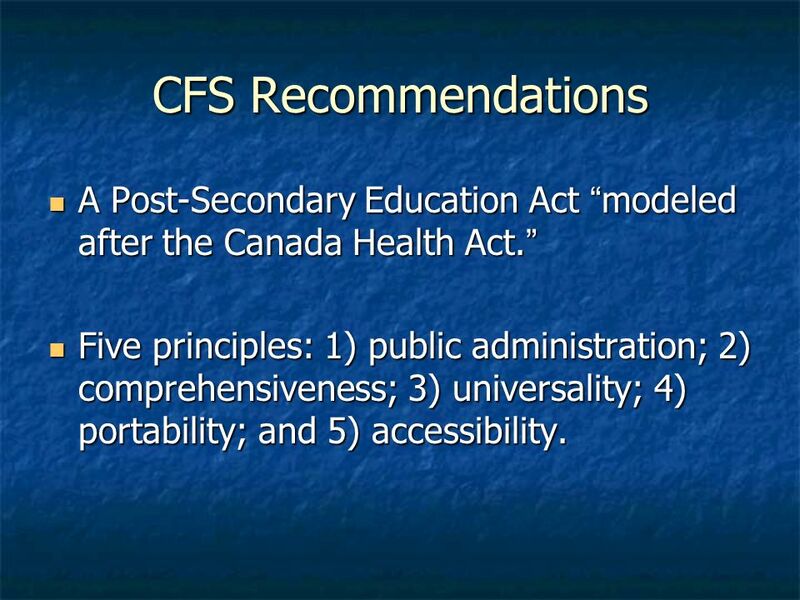 44 CFS Recommendations A Post-Secondary Education Act modeled after the Canada Health Act. 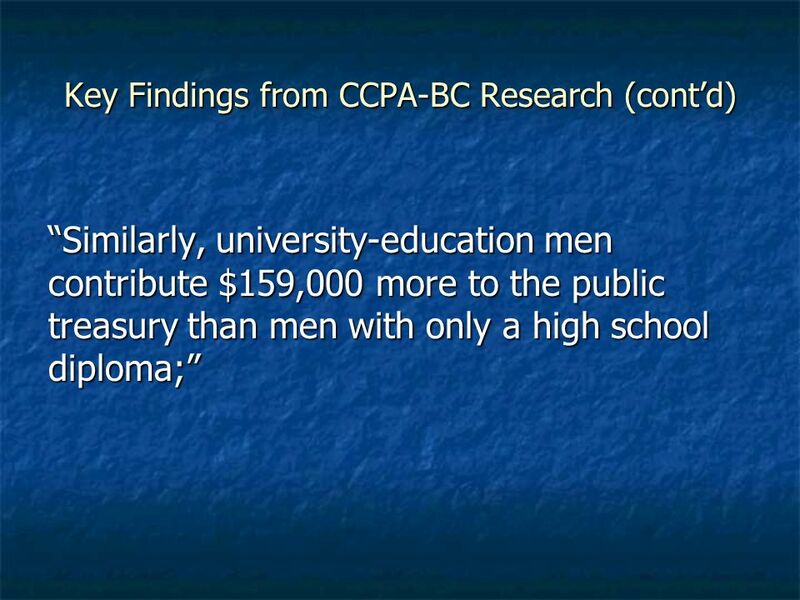 A Post-Secondary Education Act modeled after the Canada Health Act. 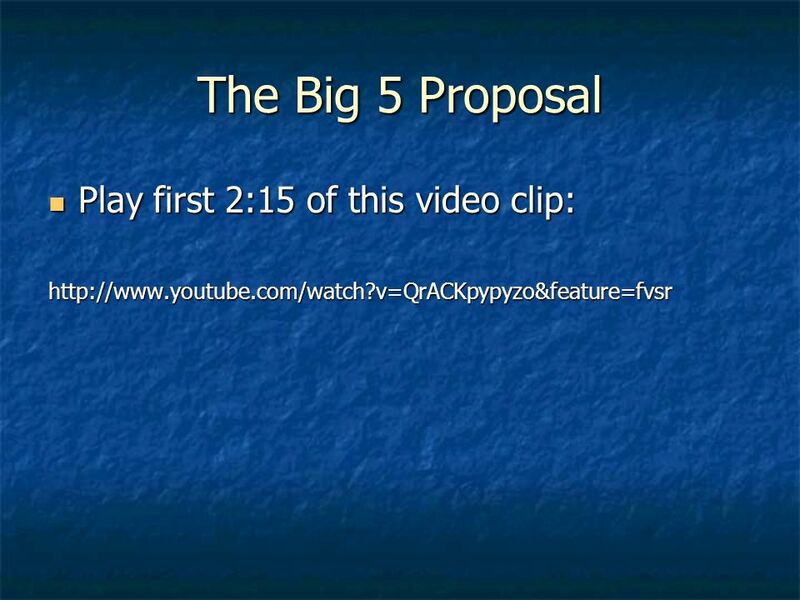 Five principles: 1) public administration; 2) comprehensiveness; 3) universality; 4) portability; and 5) accessibility. Five principles: 1) public administration; 2) comprehensiveness; 3) universality; 4) portability; and 5) accessibility. 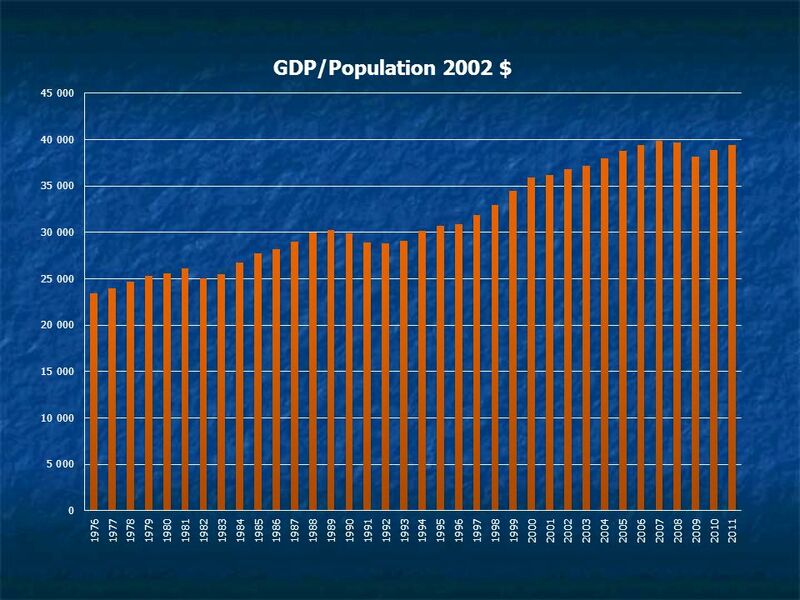 51 Concluding Thoughts The federal government spends less (in general) today than a decade ago, but not because it cant. 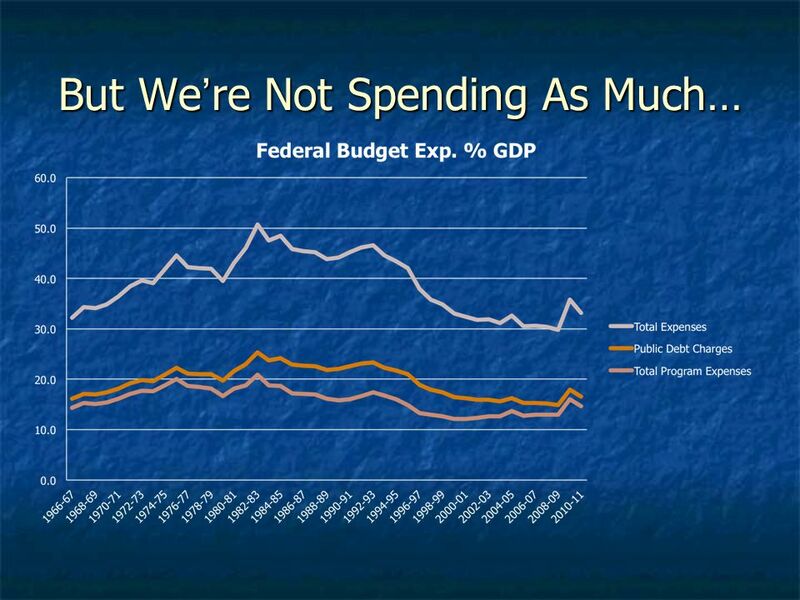 The federal government spends less (in general) today than a decade ago, but not because it cant. 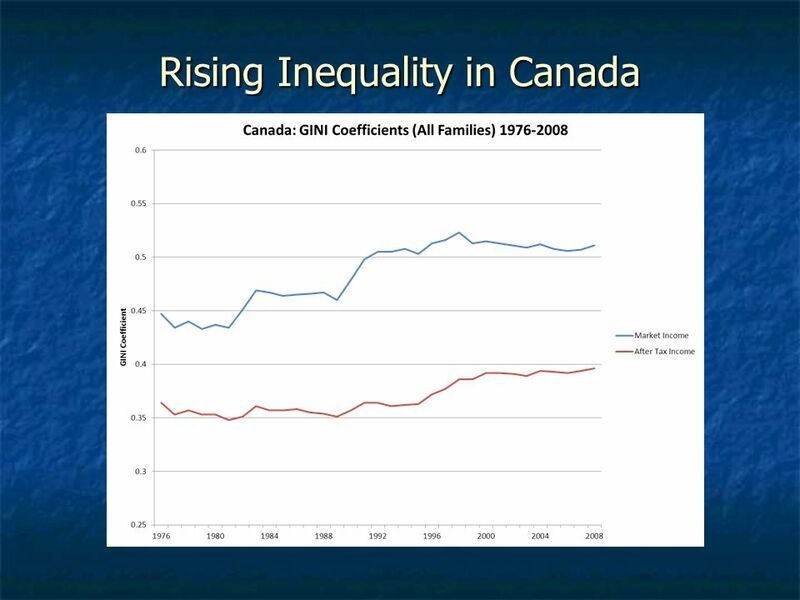 This reduction in federal spending has implications for both PSE and inequality. 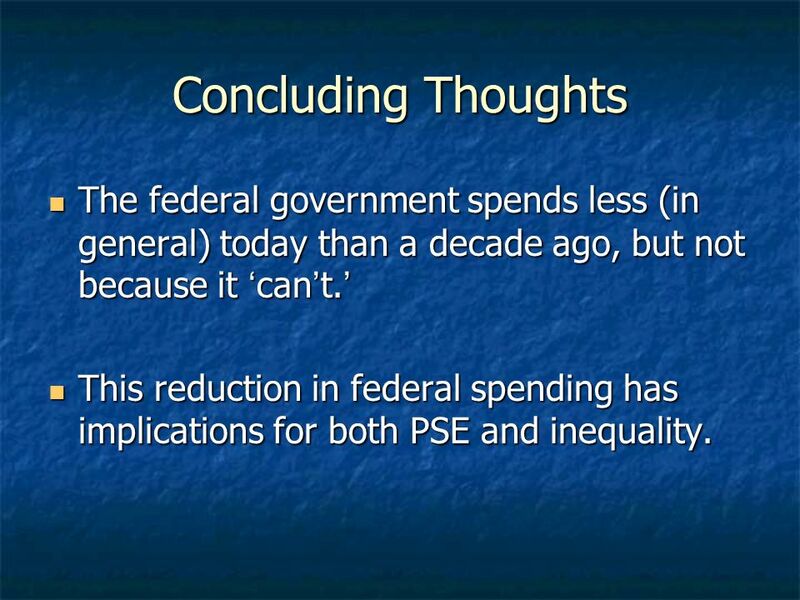 This reduction in federal spending has implications for both PSE and inequality. 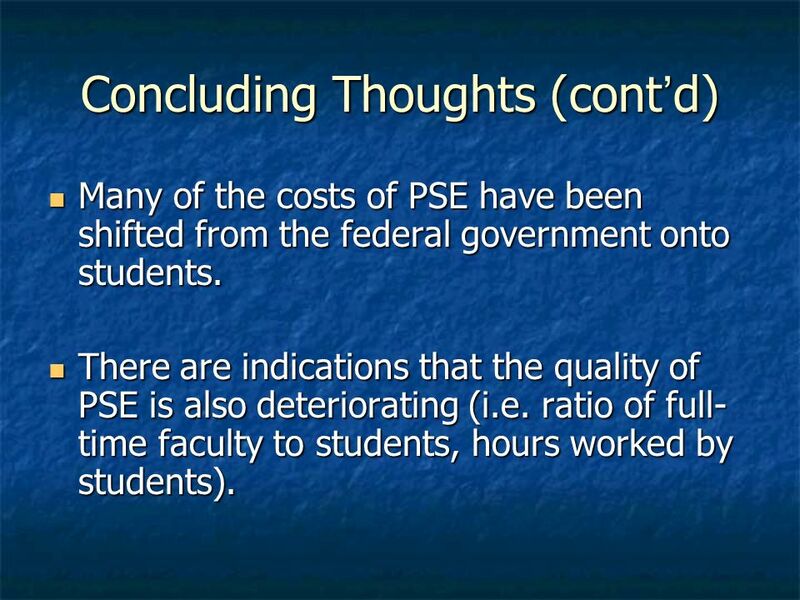 52 Concluding Thoughts (contd) Many of the costs of PSE have been shifted from the federal government onto students. 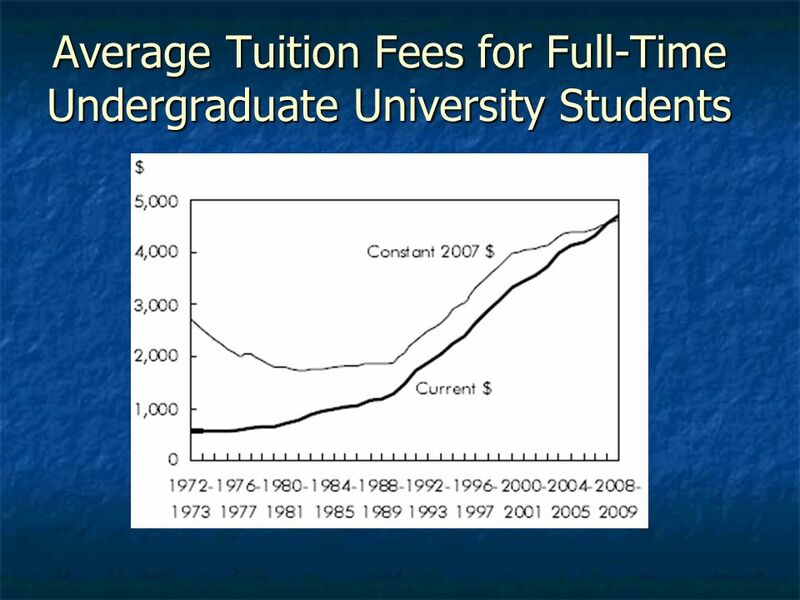 Many of the costs of PSE have been shifted from the federal government onto students. There are indications that the quality of PSE is also deteriorating (i.e. ratio of full- time faculty to students, hours worked by students). There are indications that the quality of PSE is also deteriorating (i.e. 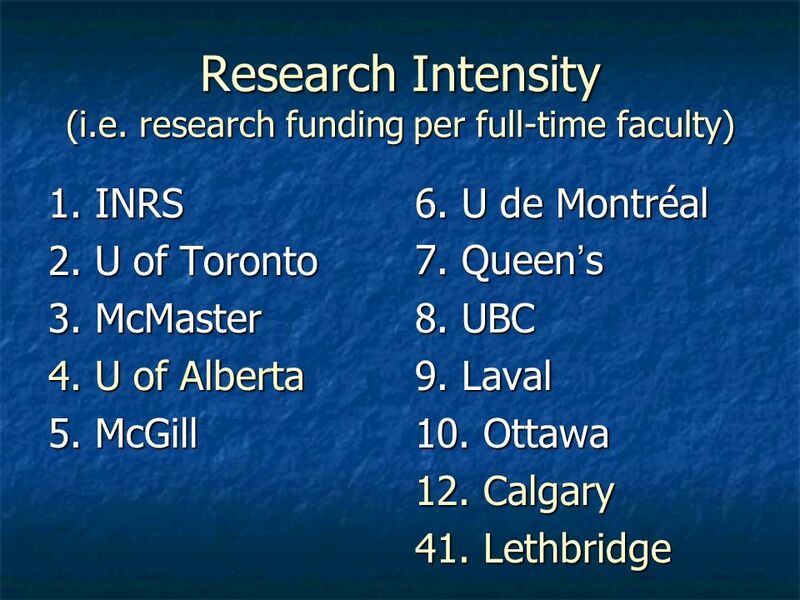 ratio of full- time faculty to students, hours worked by students). 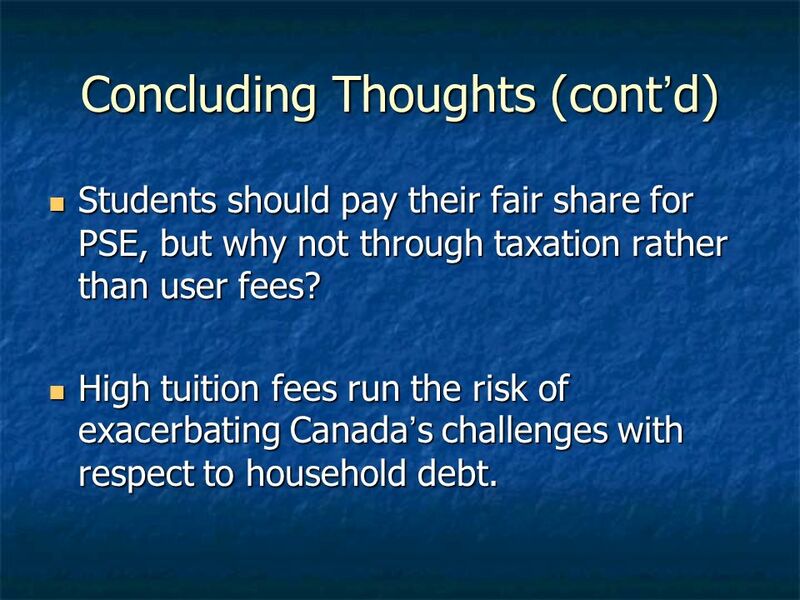 53 Concluding Thoughts (contd) Students should pay their fair share for PSE, but why not through taxation rather than user fees? 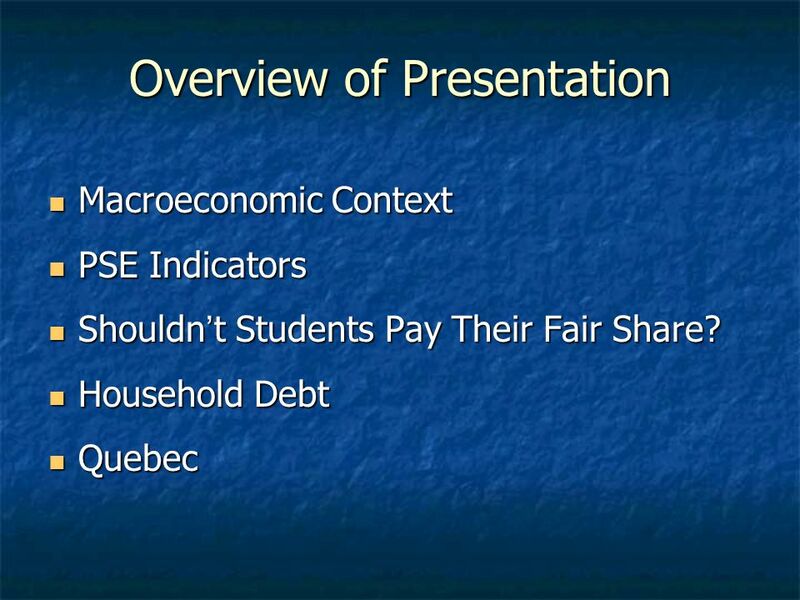 Students should pay their fair share for PSE, but why not through taxation rather than user fees? 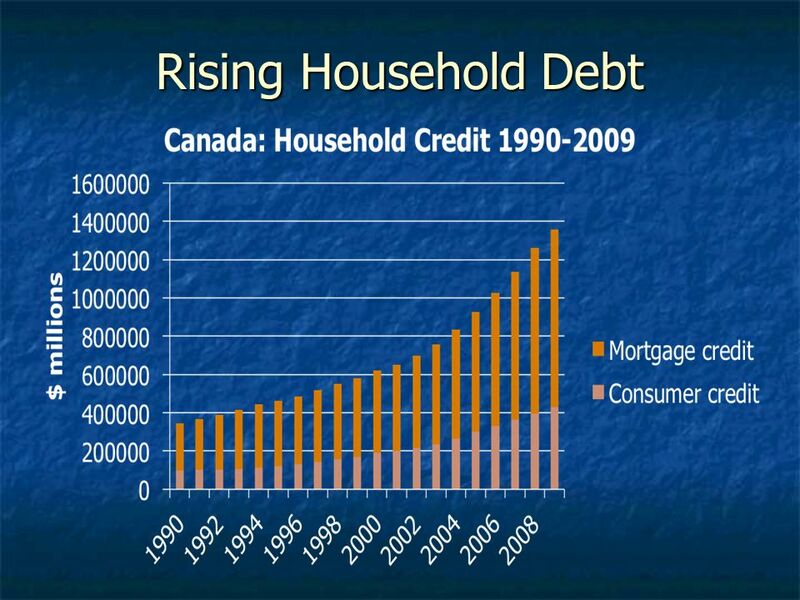 High tuition fees run the risk of exacerbating Canadas challenges with respect to household debt. 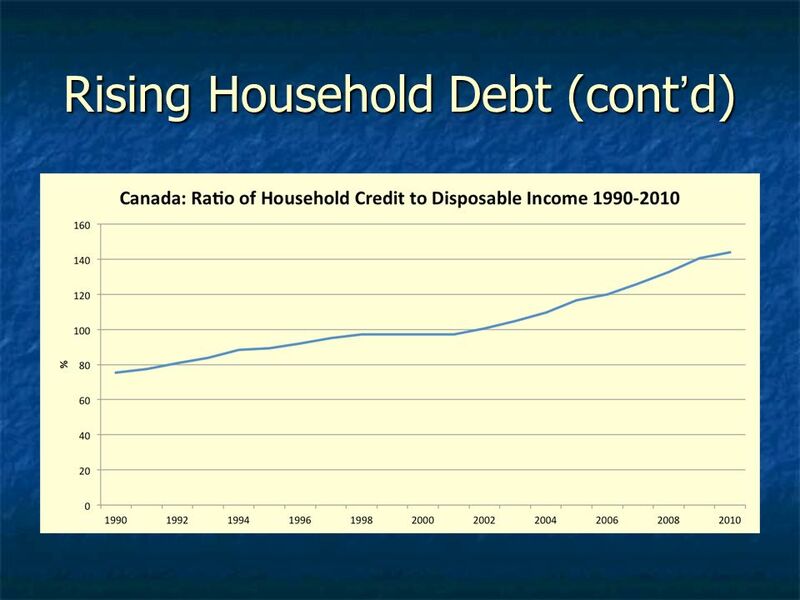 High tuition fees run the risk of exacerbating Canadas challenges with respect to household debt. 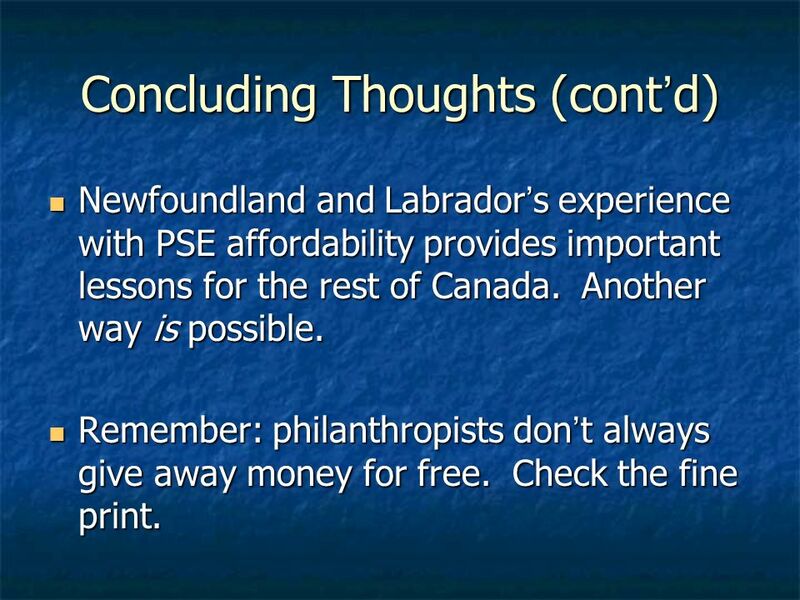 54 Concluding Thoughts (contd) Newfoundland and Labradors experience with PSE affordability provides important lessons for the rest of Canada. Another way is possible. 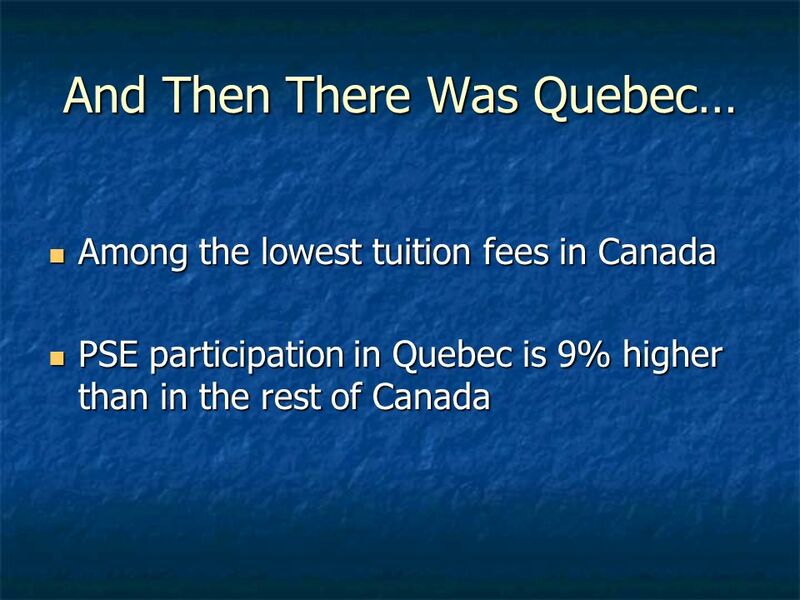 Newfoundland and Labradors experience with PSE affordability provides important lessons for the rest of Canada. Another way is possible. Remember: philanthropists dont always give away money for free. Check the fine print. 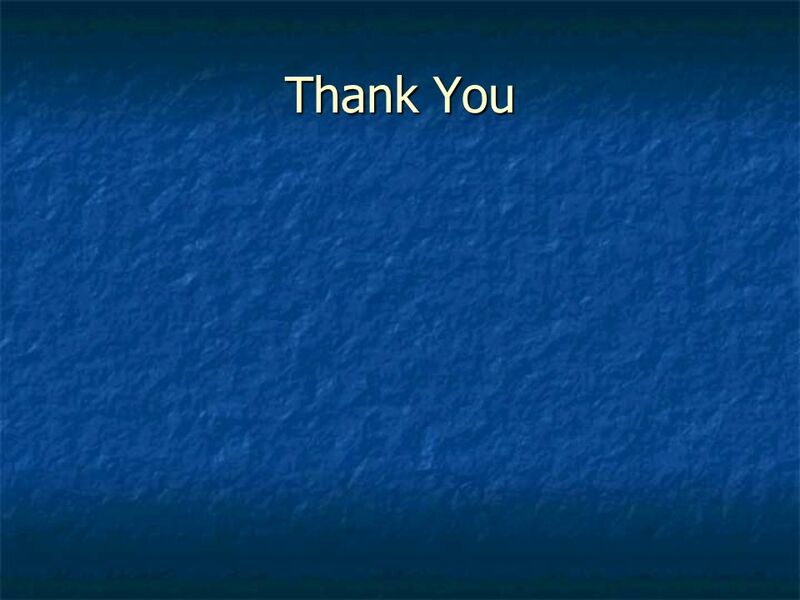 Remember: philanthropists dont always give away money for free. Check the fine print. 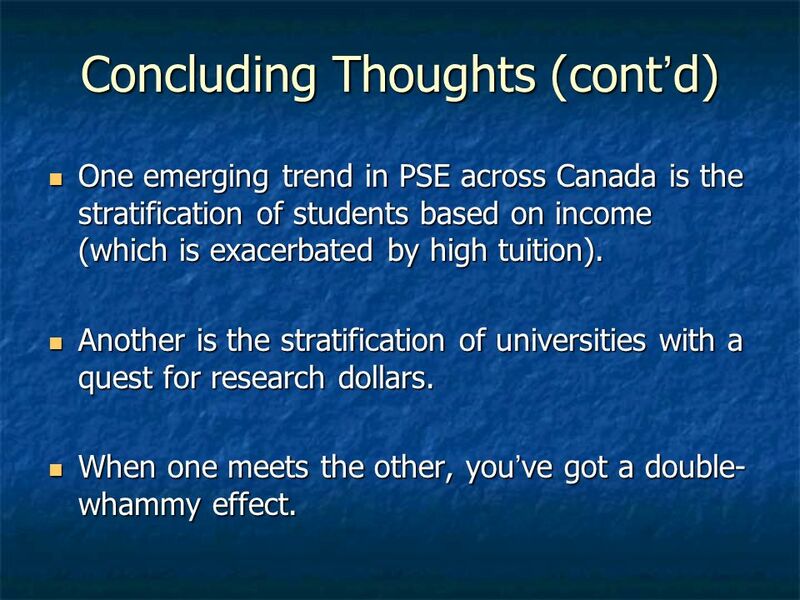 55 Concluding Thoughts (contd) One emerging trend in PSE across Canada is the stratification of students based on income (which is exacerbated by high tuition). 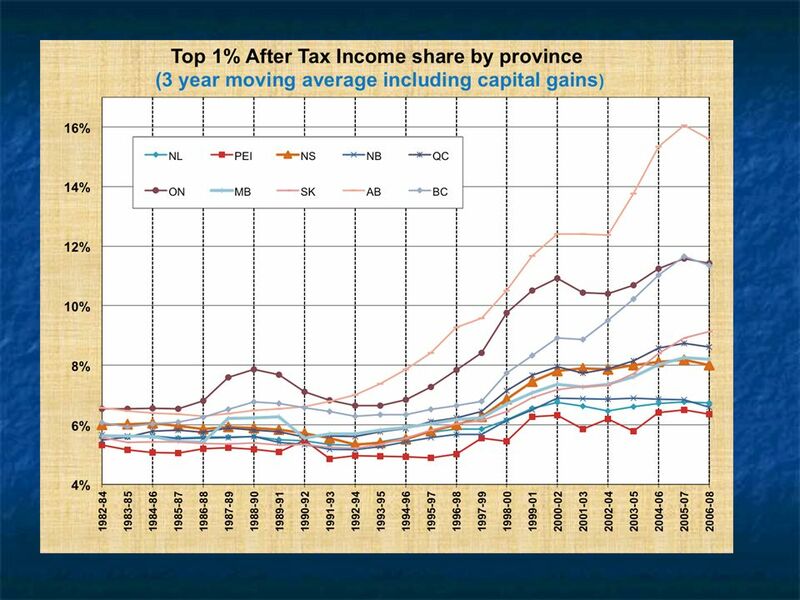 One emerging trend in PSE across Canada is the stratification of students based on income (which is exacerbated by high tuition). 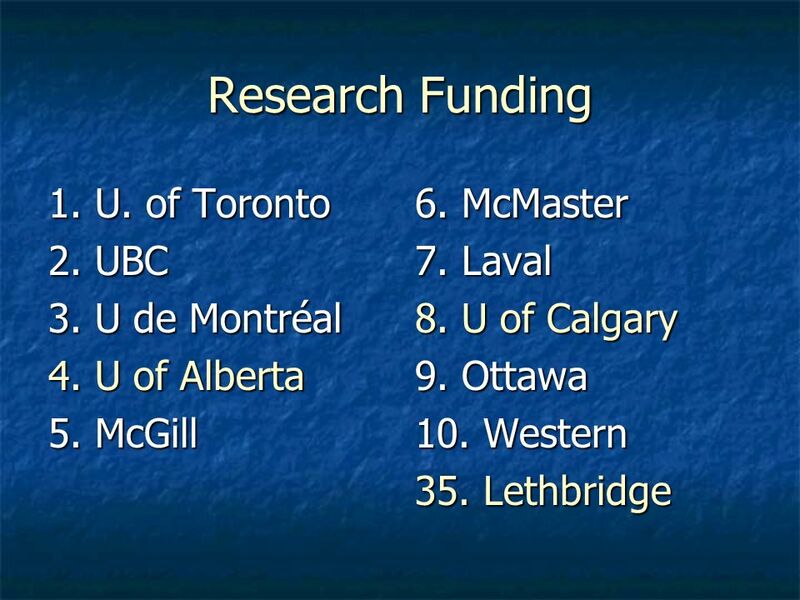 Another is the stratification of universities with a quest for research dollars. 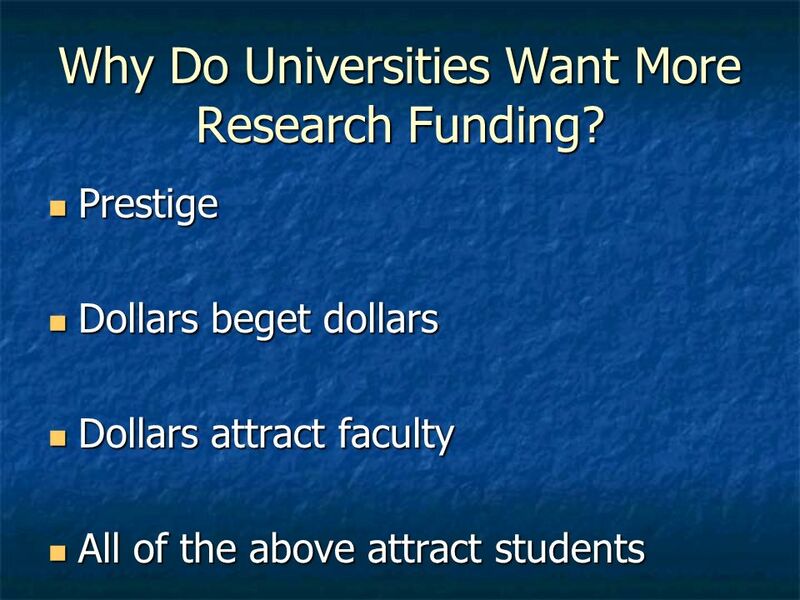 Another is the stratification of universities with a quest for research dollars. When one meets the other, youve got a double- whammy effect. When one meets the other, youve got a double- whammy effect. 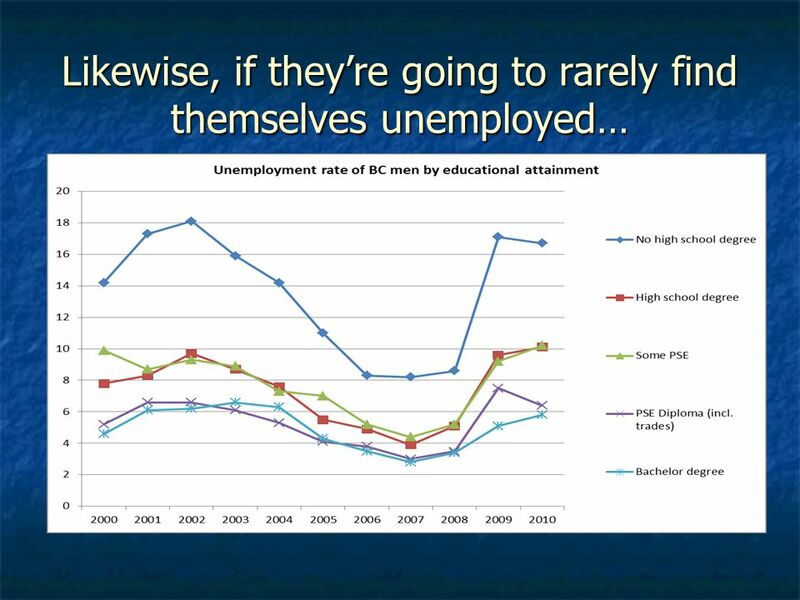 Download ppt "Canadas Self-Imposed Crisis in Post-Secondary Education Keynote Address to Alberta Union of Provincial Employees Education Sector Conference Radisson Hotel." What Next for Online Learning: The Australian Experience Stuart Hamilton AO Chief Executive Officer. 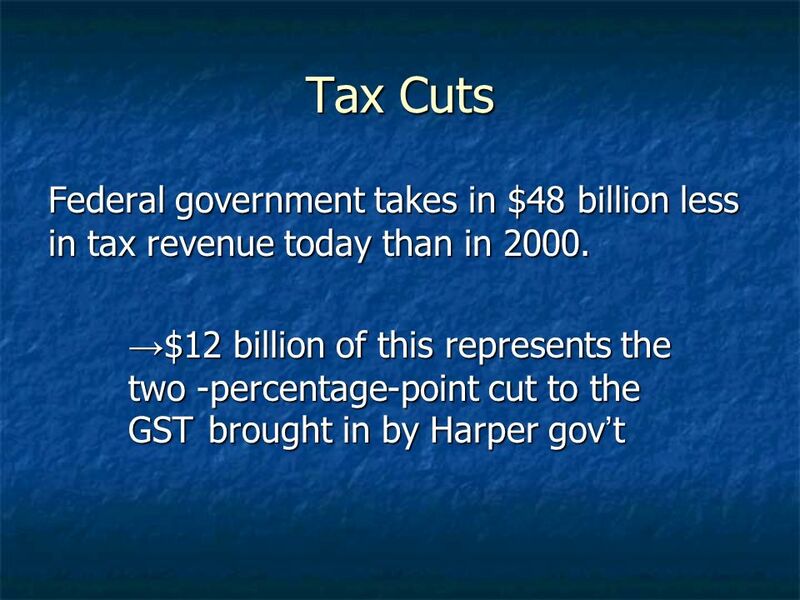 Fair Personal Tax Reform An Economic Assessment April 2008. 1 Judith Hamel, Strategic Policy and Priorities Citizenship and Immigration Canada Judith Hamel, Strategic Policy and Priorities Citizenship and Immigration. NC Budget Basics. Where We Are Just as NC schools are showing significant progress, our budget shortfall presents a significant gap.